Back in March we introduced a new Redline Guide, Ryan Welts, when he joined the team. In passing we mentioned his wife, Kristina Folcik, was also an accomplished athlete. Little did we know at the time that a little while later Kristina would hope to join forces with Redline Guiding herself excited by the prospect of working together. We have welcomed her with open arms, obviously. And it also begs the question, with such running talent on board, where are going with this? It’s almost as if we’re going to be getting into the guided trail running business or something crazy like that. Hmm, stay tuned is all we’ll say… for today. For now, at this moment, let’s shift the spotlight on the newest addition to the family, Kristina Folcik. Kristina a.k.a. Dangergirl, used to sit on the couch and eat donuts. Around the age of 19 she was introduced to mountain biking and it changed her life! She started competing and found herself racing downhill at the professional level by 2006. After a broken back, several concussions, and other serious injuries, she had to walk away from the sport. It was then she found mountaineering. In 2010, she ran the Virgil Crest 50-miler. At the at the finish line met Ryan Welts who would someday be her husband, though she didn’t know it then. Instead of moving out west she took a chance at love. Ryan was a mountain runner and it really clicked with her because she was always looking for ways to move lighter and faster in the mountains. After chasing Ryan around the mountains for a few years she eventually found that she could move quickly in the mountains. Very quickly. She was offered a spot on the La Sportiva Mountain Running Team. Her heart is in the mountains, whether she is running through them light and fast or roped up with a big pack and an ice axe in her hand. Kristina is also US High Pointer (climbing the highest point in each state) with 19 states complete, she is starting with the harder ones and finishing with the easier ones. 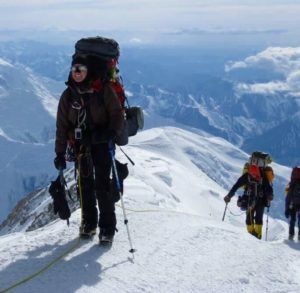 She has climbed Denali (guided) as well as taken many climbing and mountaineering courses around the country. She has successfully climbed many peaks unguided including Mount Rainier, Granite Peak, Gannett Peak, The Grand Teton, Mount Washington in winter, a single day Kings Peak in Utah, the Trapdike in winter and summer, and many more! She’s the current women’s FKT (Fastest Known Time) holder for the Presidential Traverse in an astonishing 5 hours and 32 minutes. She also holds the FKT for the Mahoosucs Traverse, Carrigan via Desolation/Signal Ridge loop, and Squam Range Traverse. 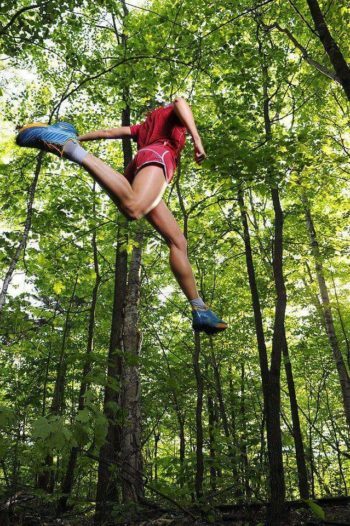 She has held and currently holds many women’s course records at several official trail races around the country in distances ranging from 20 to 100 miles. She has been on the La Sportiva Mountain Running Team since 2013 and also represents Julbo USA, Choucas Hats, and Boom Nutrition.